Born: September 23, 63 B.C.E. Augustus was the first emperor of Rome. He established the principate, the form of government under which Rome ruled its empire for three hundred years. He had an extraordinary talent for statesmanship (the ability to take an active role in the shaping of a government) and sought to preserve the best traditions of republican Rome, the period in ancient Rome's history when governing power was in the hands of the Senate rather than the emperor. 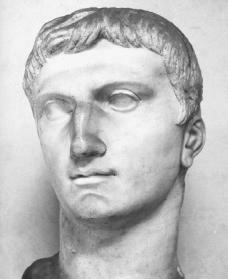 Augustus was born Gaius Octavius on September 23, 63 B.C.E. , in Rome. His father had held several political offices and had earned a fine reputation, but he died when Octavius was four. The people who most influenced young Octavius were his mother, Atia, who was the niece of the Roman leader Julius Caesar (c. 100–44 B.C.E. ), and Julius Caesar himself. Unlike Caesar, one of Rome's military heroes, Augustus was sickly as a young boy. Poor health troubled him throughout his life. Nevertheless his mother, who made sure the finest teachers tutored him at home, groomed him for the world of politics. By the age of sixteen he was planning to join his great-uncle and serve in Caesar's army. At this time Rome and the areas it controlled were governed by the Senate, composed largely of members of a small group of upper class citizens who had inherited their positions. The generals who commanded the armies that conquered new territory for Rome's rule increasingly challenged the Senate's authority, however. One such general, Caesar, had basically become a dictator (someone who assumes absolute power) of Rome. The Senate strongly opposed Caesar, and in 44 B.C.E. conspirators (a group of people who plot in secret) assassinated (killed) him. When Caesar's will was read, it revealed that Caesar had adopted Octavius as his son and heir. Octavius then set out to claim his inheritance in 43 B.C.E. , changing his name to Octavian (Gaius Julius Caesar Octavianus in Latin). Octavian's rival at this time was Mark Antony (c. 83–30 B.C.E. ), who had taken command of Caesar's legions, the largest Roman military units. The two men became enemies immediately when Octavian announced his intention to take over his inheritance. Antony was engaged in war against the Senate to avenge Caesar's murder and to further his own ambitions. Octavian sided with the Senate and joined in the fight. Antony was defeated in 43 B.C.E. , but the Senate refused Octavian the triumph he felt he was owed. As a result Octavian abandoned the senators and joined forces with Antony and Lepidus, another of Caesar's officers. The three men, who called themselves the Second Triumvirate (a group of three officials or government leaders in ancient Rome), defeated their opponents in 42 B.C.E. and assumed full governing power. They then divided the empire into areas of influence. Octavian took the West; Antony, the East; and Lepidus, Africa. Over time Lepidus lost power, and it seemed impossible that Antony and Octavian could avoid clashing. In 32 B.C.E. Octavian declared war against Queen Cleopatra of Egypt, to whom Antony was romantically and politically tied. After a decisive naval victory in this conflict, Octavian was left as master of the entire Roman world. The following year Antony and Cleopatra committed suicide (killed themselves), and in 29 B.C.E. Octavian returned to Rome in triumph. gave Augustus enormous control over the army, foreign policy, and legislation. As emperor Augustus concerned himself with every detail of the empire. He secured its boundaries, provided for the defense of remote areas, reorganized the army, and created a navy. He also formed a large civil service department, which attended to the general business of managing Rome's vast empire. Augustus was also interested in encouraging a return to the religious dedication and morality of early Rome. His efforts included passing laws to regulate marriage and family life and to control promiscuity (loose sexual behavior). He made adultery (when a married person has a sexual relationship with someone other than his or her spouse) a criminal offense, and he encouraged the birthrate by granting privileges to couples with three or more children. Augustus suffered many illnesses, but he outlived his preferred choices for legal heir. He was finally forced to appoint as his heir Tiberius, his third wife's son by her first marriage. Tiberius took power upon Augustus's death on August 19, C.E. 14. Jones, A. H. M. Augustus. New York: Norton, 1971. Nardo, Don. The Age of Augustus. San Diego: Lucent, 1997. Southern, Pat. Augustus. New York: Routledge, 1998. Great article - used it for one of my Ancient History essays. Thanks a lot to the authors!